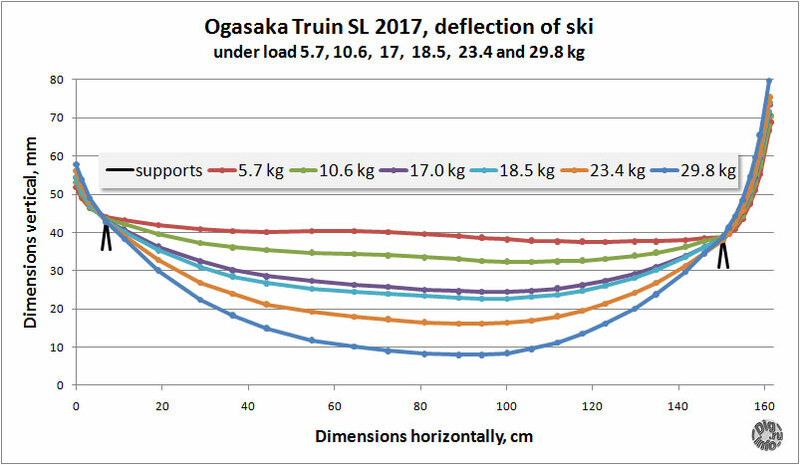 In this note I present the measurement of deflection shapes for Ogasaka Triun SL skis model years 2015, 2016, 2017, with a focus on the characteristics of the model 2017. 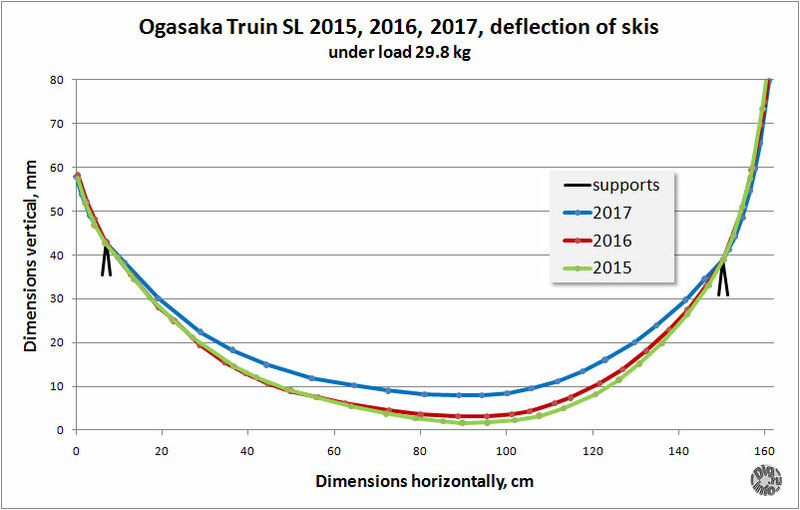 In this case (Ski 2017), we can refer to Ogasaka Triun SL models 2015 and 2016, whose behavior on snow is known, and see what has changed. First, consider that it may be noticed from the catalog data. The changes that relate to shape of deflection and general stiffness is the “rocker” and “stabilization along the entire length of ski” . More precisely these things were removed from the model 2017 (based on catalog data). Let’s check up on real ski. Rocker is actually removed. This can be seen by squeezing skis connected on a sliding surfaces and looking at the shape of the tip bend. In model 2016 tip curled more smoothly and point of “divergence of edges” which marked by a red line on photo is more rear. Unfortunately, this is all that can be noted. Rocker is a form of “zero” shape of curl, given constructively. So it is not connected to bend of ski under load. But it can change the total shape of deflection. Of course, when riding, tip not “looking up”, as the main position of skis is on edges, respectively rocker is involved to the formation of a soft arc. But, in general, these arguments are pretty abstract, one can only note the design change, which can affect the movement of ski in an arc, as well as many other parameters. With the “stabilization of the entire length of ski” all a little more confusing. 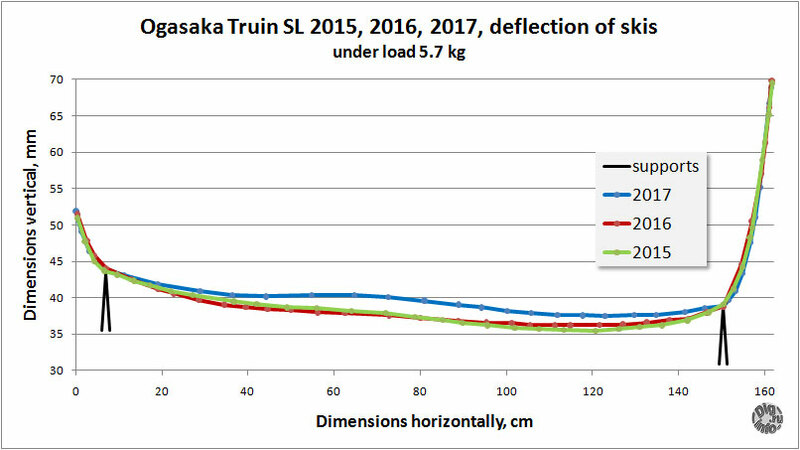 Instead the scheme, as it was given in explanation of such stabilization, for particular model Ogasaka Triun SL I’ve found on the net this picture, which is also shown in the catalog 2016 (but very small in size). 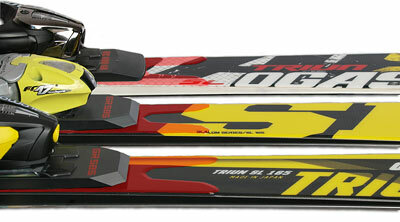 It can be seen that the FLS plate can hardly claim to be on “full-length” of ski. Rather, it duplicates the function PPF (Power Platform Function). Nevertheless, it seems to me that FLS can influence to shape of deflection and to stiffness of skis. In the model of 2017, according to the catalog, instead of FLS is located “just stabilizer” STB, about which no data on site yet. FLS, as seen in the picture is located at the top and seen as relief at topsheet of ski. This is true. At the photograph I fill with red these reliefs. As one can see on the model 2017, it is still here, and even become larger. Therefore, I would suggest that the STB is just a new name for the “little FLS”. It is interesting to note that this element has undergone with noticable changes. If to take a 2015 model as a starting point, in the 2016 model it was shifted forward by about 1 cm following the shift of midle of boot line and became a little bit longer in the front. In the model 2017 mid-line of boot has not changed, but this element is shifted further forward and the shape of the front cut-out has changed, “fingers” became longer. Weight of bindings is not known, while the sum weight of all other objects in the image is 29.8 kg. Photographed with lens with effective focal length 70 mm at a distance of about 4 meters, camera was put on a tripod, the position of the camera in the process of measurement was not changed. Then, with the help of Photoshop was made a small corrections for precise images superposition and made per-pixel digitization on the lower line of edge (that is, on a sliding surface) from the tail of ski to the point where the edge is goes in the plastic toe. 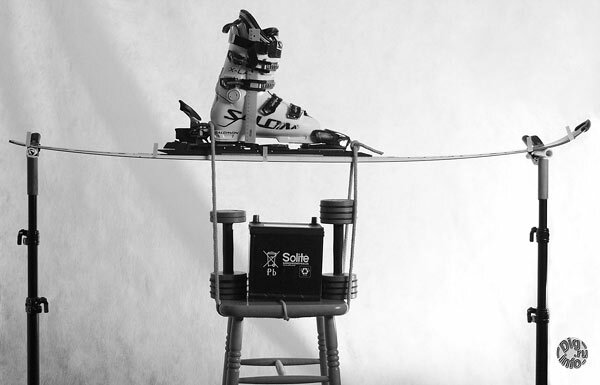 The vertical scale was controlled by ruler (fastened to boot), and the horizontal by means of a separate photo with a folding ruler of 2 m. The ski was tuned horizontally by the platform (bindings) region, so the rear support is approximately 5 mm upper then front support. Zero deflection, in my opinion does not matter much, especially on a new ski, so consideration was began with load 5.7 kg (this weight of boot and stool 🙂 ). From my point of view load of 5.7 kg is enough to remove “camber” (reverse deflection of unloaded ski), so this specific shape (shelf in the middle) at the ski 2017, it is rather a design feature. However, deviation from the “round” inflection only about 2 m, hardly to notice by eye. 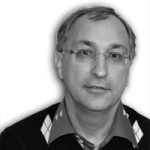 About ski 2015 and 2016 it may be noted that the deflection is almost identical, with a tendency to have a better balance of ski 2016. It seems that this is the result of a shift forward of plate FLS = STB 🙂 . Ski 2017 on a minimum load is already showing a smaller sag. Hard to say this is due to stiff “camber” or a higher stiffness. Maximum load of the stand shows that ski 2017 looks considerably stiffer. To begin with, I note a well-mated deflection of ski with a bend of tip. Especially in the ski 2015 (just this ski and this load is shown in the photo of stand). This could be good illistration for patent Ogasaka technology F.L.F when shape of sidecut continues into bend tip. Here it well seen that all length of ski is one smooth curve, so cutout could be lasted to the end of graph. 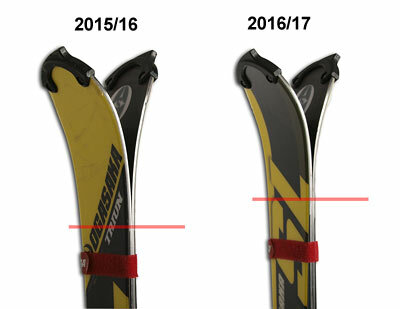 From a comparison of skis 2015 and 2016 it shown that the shapes of the tail deflection coincide completely, and tip of the ski 2015 is slightly softer. Given that the width of the ski 2016 is less by 2 mm, it can be stated that internal design or materials are changed. But in general, ski of 2015 and 2016 are similar. Ski 2017 again shows significantly less deflection, but the deflection shape becomes smooth, without a “shelf”. 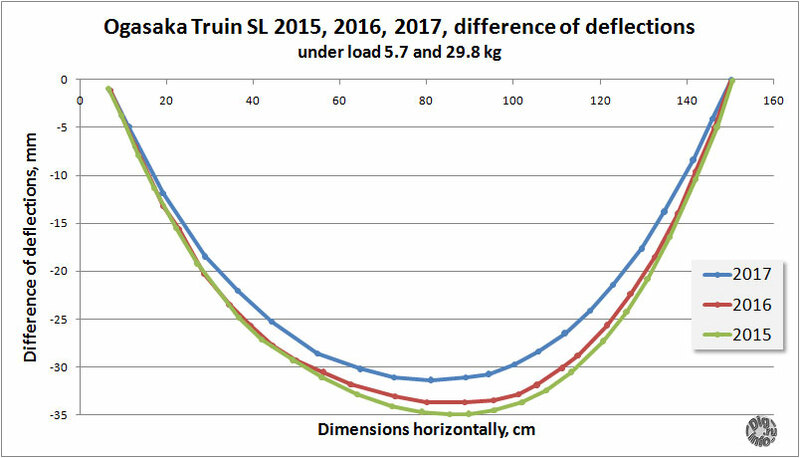 Given that the deflection of ski 2017 at the minimum load was also less one need to compare the difference of deflections in minimal and maximum load in the area between the supports. The picture has not changed in difference of sags, so ski 2017 is significantly tougher. The shape of the curve of the difference remains smooth, ie, “shelf” effect is substantially less than change deflection under large load. Nevertheless, it is interesting to see, under what load this “shelf” go away. For this deflection shapes were digitized at different loads. The graph clearly shows that at high loads (23.4 and 29.8 kg) deflection curve is smooth. At medium loads (17-18 kg) in the middle of the ski can be identified straight section. That is, the ski bends smoothly in the tail and tip, while in the middle ski is straight, not at all deflection curve. At lower loads, this effect is enhanced, gradually appears the reverse deflection in the middle of the ski. In this regard, two points should be noted. Firstly, Iwamoto san said that for ski 2017 design processed just in this way, the middle is made more straight so that tip and tail begin to sag as if with a break from the “shelf” in the middle (as it illustrated in curve with the load 17-18 kg). It is made for a softer completion of the turn when skiing. 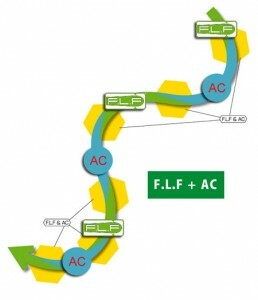 Secondly, some of the same according to a F.L.F + AC technology (“leading tip plus accumulator”). The essence of accumulator is the specific restriction of the flexibility of the middle part of the ski, so ski later falls on the edge in the middle, but later released, and, as a result on the exit of the arc is achieved greater control with less “throw away”. Moreover, at dynamics and statics (only statics could be measured on my stand), the effect will be different, because the “delay”, ie accumulating effect can not be measured in the statics. Thus, one can conclude that the ski of 2017 is greatly redesigned on deflection characteristics. It can be assumed the strengthening of the “rail” in the middle of the arc and greater control on the exit of turn. But to tell the truth I am concerned, this is done by a markedly increase in general stiffness of ski. That is, if to refer to Ski 2015 and 2016, then the middle part of the ski 2017 precisely made tougher, and tip and tail may be the same, but can also be tougher. Now, finally, we can get back to where I began. It is again as if I “squeezed” ski by hands. And can not make some speculations how it will behave on the slalom track 🙂 If ski of 2017 remained similar to 2015 in 2016, then it would be possible to say something. And so – no 🙂 Basically, I have confidence that skis behavior does not change much, because in my experience, manufacturers retain the character of skis.